Reprint. Translated from the Italian "An Allen Lane book"--Back cover This translation originally published: UK: Allen Lane, 2015. THE PHENOMENAL BESTSELLER'There's a book I've been carrying around like a small Bible, Seven Brief Lessons on Physics' - Benedict Cumberbatch 'With the publication of this million-selling book, Rovelli took his place with Stephen Hawking and Richard Feynman as one of the great popularisers of modern theoretical physics' - Sam Leith, SpectatorEverything you need to know about modern physics, the universe and our place in the world in seven enlightening lessons These seven short lessons guide us, with simplicity and clarity, through the scientific revolution that shook physics in the twentieth century and still continues to shake us today. 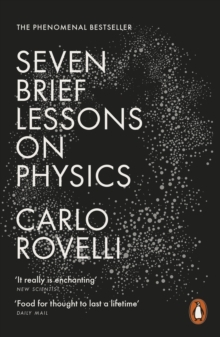 In this mind-bending overview of modern physics, Carlo Rovelli explains Einstein's theory of general relativity, quantum mechanics, black holes, the complex architecture of the universe, elementary particles, gravity, and the nature of the mind.